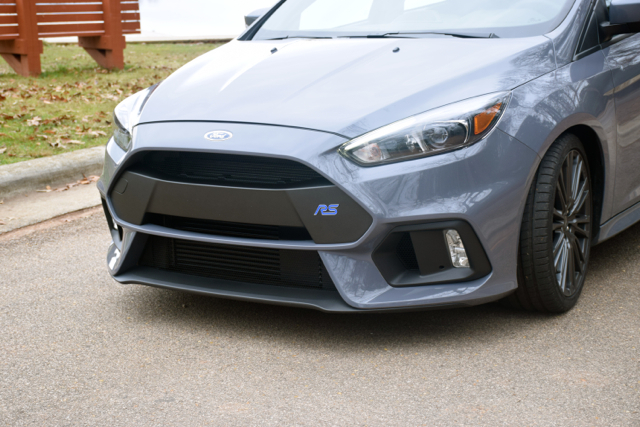 The top-of-the-range Ford Focus RS offers a unique winter prep package. Arriving soon: 2016 Ford Focus RS. The Ford Focus RS cannot arrive in North America soon enough for enthusiasts. As the work of Ford Performance, this hot hatchback on steroids promises to be the fastest machine this side of a Mustang GT. Its all-wheel drive goodness should give a certain Volkswagen Golf model a run for the money, no matter the season. Yet, the Ford Motor Company has taken no chances that Focus RS owners will become stranded due to snow or lose out to a competitor. Even before this model arrives stateside, Ford has prepared a winter tire and wheel option as a factory accessory. In doing so, the package meets Ford Performance’s exacting standards. It is also the first-ever factory-purpose winter tire package offered by an original equipment manufacturer in North America. Ford says that the Focus RS Winter Wheel & Tire Package offers a set of wheels and tires unique to the RS. The package was designed to ensure Focus RS owners are not just able to travel around in the snow, but do so while maintaining their driving enjoyment. Nevertheless, the Ford Performance team had their work cut out for them as they understood that Focus RS customers would demand nothing less than equipment optimized for winter. Furthermore, the performance team was also tasked with ensuring that the tires and wheels met certification requirements — no easy task considering that winter-only tires had never previously been authored. Thus, the Ford Performance team had to create a new set of standards befitting the absolute worst winter circumstances. Ford’s engineers and technicians went to work by testing the new standards at a pair of locations in northern Michigan and Sweden, with the plan to guarantee the qualify and performance levels expected. A comprehensive array of tires and wheel combinations were examined. Specifically, ride, handling, and performance attributes in an assortment of wintry conditions were carefully observed and recorded before a winning arrangement was selected. That arrangement is composed of 225/40R18 Michelin Pilot Alpin PA4 tires mounted to an all-new 18×7.5-inch wheel, paralleling the characteristics of the base Focus RS option, yet swathed in sparkle silver to conceal salt spray. Ford says the set includes tire pressure monitoring sensors along with fully mounted and balanced center caps and prepared for dealer installation. Notably, the wheel and tire are narrower, what Ford says will provide improved snow traction, while the overall diameter is smaller, so owners can outfit chains if required. Available only in North America as a $1,995 option, the Focus RS Winter Wheel & Tire Package comes standard on every Focus RS delivered in Canada. The Focus RS arrives at dealerships in North America beginning this spring. Production of the all-new Focus RS is already underway. Built in Germany, the new model should help Ford maintain its success in a narrow, but highly competitive hatchback segment. US sales of the Focus ST increased by 9 percent last year and by 4 percent for the Fiesta ST. Besides the Focus RS, Ford Performance is bringing two other models to the market this year: the Ford F-150 Raptor this fall and the Ford GT super car later in the year. By 2020, Ford Performance will have 12 performance vehicles available globally. Ford Focus RS photos copyright the Ford Motor Company.